Here is a canvas. A blank canvas. Unmarked, untouched, and unspoken. Not yet conditioned and still without restrictions. Not yet stained, spotted or signed. And, given this unmarked canvas, there are yet no limits to what may be said, stated, articulated, called forth. For what is a painting? It is marks on a surface, markings by the conscious and planned actions of the artist. The movements of a hand, a hand that holds a brush, a hand and a brush that brushes, strokes, sweeps, adds or fastens paint to a canvas. And then again. More movements that mark, touch, speak, condition and, ultimately, restrict and delimit the canvas. Such is the condition of each painting; it speaks by limits and restraint, it utters because of its boundedness and its restrictions. The paintings of Synnøve Persen begin from the beginning, with the empty and open canvas, the blank flat canvas yet without a destiny or a story or a goal. Then a mark is made, yet another, and the canvas lingeringly and gradually leaves its initial void and enters a universe of meaning, distinction, and difference. For each stroke, each mark, the canvas grows and swells towards significance, towards representation. Now a signifying surface appears. The canvas is written, spoken, marked, signed. Now the canvas speaks. Claims and asserts. 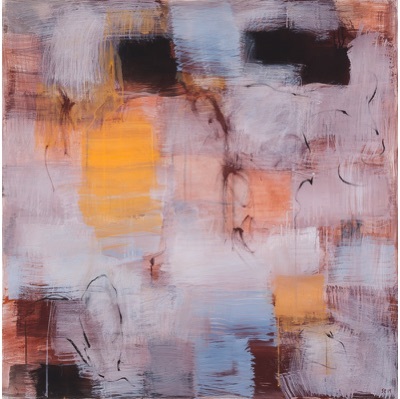 Yet, the paintings of Synnøve Persen begin from the beginning as they arrive without premeditations or premonitions. Plans or ambitions. References or determinations. For each painting, method and medium, subject matter and grammar are invented, set anew. Each painting acknowledges the void and its infinite possibilities. Each painting zeroes calibrations and expectations, each painting resets the system, restarts the program, the process. Yet the blank canvas is an illusion and a necessary paradox. For what makes up the brush stroke, what guides the hand, constitutes its rhythm and duration, its sense of line and density, its touch and timing; what carries and communicates from one painting to the next is experience and acquaintance, the knowledge, the tacit knowledge of hand and arm and body from painting the paintings, from performing the canvases already performed. And, moreover, a knowledge and a certainty that extends beyond the individual artist, the most current performer and thus forms the collected experience of painting, of adding brush strokes to the blank and blind canvas, in short, the history of that which is not-nature, the history of painting, the history of art. Never does one arrive to the canvas as if before language, without culture, outside of the self. This is the paradox: Planned intuition. Experienced beginner. The work of Persen is cumulative, additive. It matters that this particular painting already exists. It matters that this painting is painted now. That this painting is not yet painted. Indeed, experience also underlines the autonomy of the painting itself. The painting allows itself to happen, as long as the artist lends herself to the wishes of the painting. To ask the painting what does it want and then play its score. But there is another paradox. Or, perhaps, a curious doubling, a case of story and counterstory, image and counterimage. 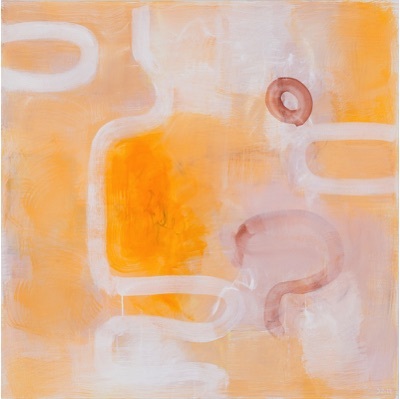 The paintings of Synnøve Persen are, consciously and precisely, about the art and the act of painting. These are paintings about paint, paintings about paintings, about other paintings, about the history of painting, about its grammar and language and advances and shortcomings, about what is it really that goes on when we add mark to the surface, when we laboriously and painstakingly, even euphorically and carefreely, add paint to the canvas. In fact, the art of Synnøve Persen is even a kind of mini-history of painting as Persen returns, in each painting of hers, to the fundamental concerns: What is a brush stroke? What is the relation between the matter of paint, its very material substance, and the gesture of painting, between substance and figure? What is the relation between motif and the very accumulation of paint itself? Between the sheer presence of line, field, colour or volume and the performance of the painter? 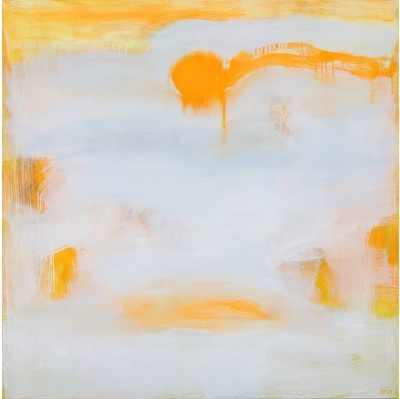 Moreover, more than answering, each painting rephrases the questions. Nonetheless, the art of Synnøve Persen allows for another world. Yes, these paintings live their lives, each an independent intervention into the world of paintings, the autonomous universe of art. Mostly square, flat canvases, all happens here within the frame, the boundary of this painting, of its world. What colours act within this frame? What volumes are built? What geometries are produced? What is the relation between line and field? But, simultaneously, the paintings of Synnøve Persen, such as the now most recent, included in this volume (Det nordlige havs frosne drømmer, Bleeding Sun, En lys ettermiddag, Hole in the Ice, Sárggastat), claim their referent, their exterior Other. This other is Nature. It may be the real physical landscape of the Fennoscandian North. It may be a more abstract or generalized nature with its basic ingredients, or grammar: Rock, soil, water. The sky. The horizon (even as it is almost consistently negated in the vibrating flatness of Persen’s paintings). The rhythms of the day, of the seasons and of the year. Geological and meteorological time. The sun. It is a phenomenological nature, a nature of observation and sensory perception, even as it invokes the cycles of life, death, eternity. Importantly, the source of this Other is ambiguous and multiple. A particular memory? A sound, a smell, a sight? Accrued experiences that translate themselves to a grammar of visual expression? Or other imaginations? All of the above? But then again, Nature, in this case, may even simply be an archive of words, phrases, that return us to the world of paint, the world of art, and provide with a scheme or tools that further enable this encounter. In other words: An alternative language to narrate each work of art. Title as description, as a tool for re-imagination. This particular painting is its own landscape. Its own bright afternoon. These paintings do no refer, do not simulate, do not represent. They are. Perhaps we have to say it again. The paintings of Synnøve Persen are not about anything. They simply are. From within their articulate boundedness and exquisite restrictions, they claim existence. This painting here is not even about itself. It is. It brings forward existence. And this is how it unearths the unknown. The canvas is square and stretched onto a wooden frame. 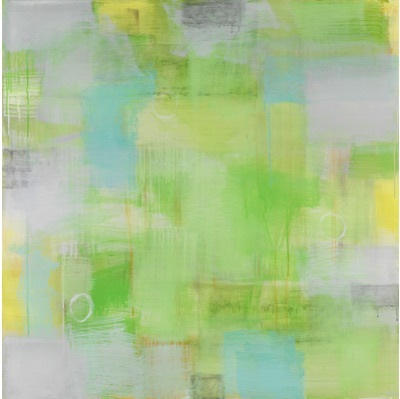 A horizontal stroke with the brush creates a broad line of white paint on the canvas. Most strokes of the brush are indeed vertical or horizontal. There are few diagonal strokes. 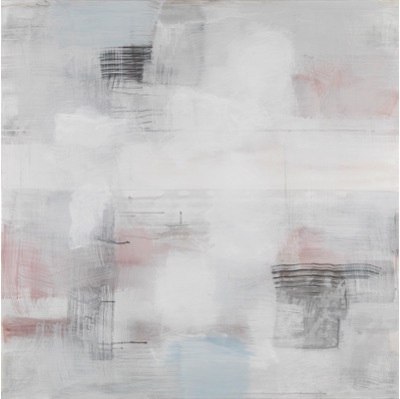 More strokes of white paint collaborate in building a pattern, a grid, groups of off-white lines on the painting. As the canvas stands on the easel, gravity also contributes as paint trickles downwards. 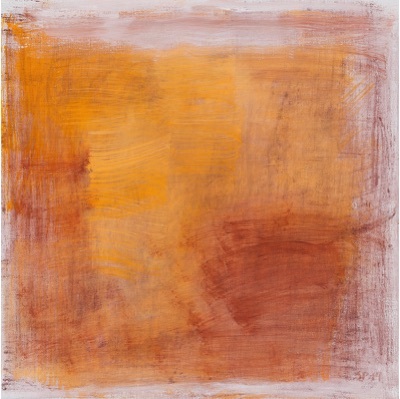 The distribution of whites are located on “top” (there is not so much a spatial illusion, but simply a sense of order of execution) of a somewhat rusty brown background, a canvas grounded in brown as its first marking. The palette of the painting is solemn, quiet, perhaps modest. Symmetries, or repetitions, generate calm and recognition. Sárggastat I is followed by Sárggastat II. 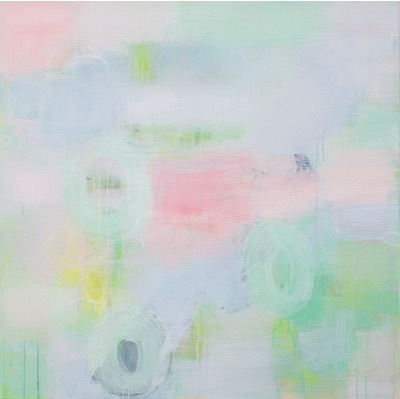 Which is, again, the process of painting, of creating, in the art of Synnøve Persen. A theme, a scheme is born – a set of colours, a certain geometry, a particular spatial distribution. It may be completed, or exhausted, within one frame. Or it may generate a series. Where repetition and variation create new paintings. Here, again, the title is eloquent and revealing. Sárggastat. Sketch. In encountering the not known, terra incognita. For each painting is its own map, its own prototype. A sketch, a manual, a model, a map. And, thus, the finished painting. Marked, touched, spoken; as it is. acrylic 2013, 150 x 150 cm. In the exhibition terra incognita, the artist Synnøve Persen explores the unrecognizable in the term terra incognita. Through the usage of a poetic abstract language, she gives us her portrayal of terra incognita, the unknown land, the land that does not exist. The exhibition marks the Norwegian Parliament’s constitution anniversary 2014 and puts attention towards Sami nation building, in which Sami artistic expression and Sami art organizations played a vital role. The exhibition also alludes to how Sami people’s position as Norwegian citizens, and as a modern indigenous people, is built up within the Sami society. Terra incognita is the starting point of this poetic abstract exhibition project, where the theme is present through the shapes and colours of the paintings. These are not illustrations that are directly recognizable, but rather metaphors, expressions for the unrecognizable, that still brings out the power of thought and are able to illuminate the recognizable. Synnøve Persen who is a Sami artist, expresses her themes with an abstract imagery. 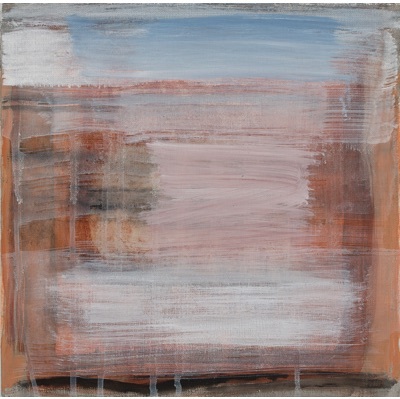 Her starting point can be concrete landscapes, as well as she can take a non-figurative approach. As a painter and a poet, she often uses the northern landscape as a metaphor, both because this occurs natural to her and because the connection between culture and nature creates a poetic room through the animism term. These kind of associations towards landscape, help introduce a form of space in the art works; subjective impressions of scenarios and moods in the Arctic landscape that occurs through sensitive brush strokes and the lyric and meditative mood within the artist. Associations towards landscape also introduces the contrast between solid masses and more fluid forms, which the brush strokes do not necessarily evoke on its own. You can find portrayals of mythical themes, where the references are primarily forces of nature, rather than formations in nature. In investigating the history of abstraction from a Sami perspective, we have the ability to expose some of the cultural restrictions that often arise in discussions on Western artistic modernity, and give a more global perspective. Where culture specific opinion is changed, reconstructed, abstracted and even broken down in the process; the meanings brought forth in the art works are specific to the places where they are created, and are often concerned with matters on Sami identity in the modern world. Synnøve Persens art works represents both modernity and Sami tradition. They exist both inside and outside the framework of Western traditional art institutions. This ambivalence is in the core of Persen’s critical and oppositional consciousness. In her artistic practice, Synnøve Persen has put emphasis on an esthetic or pictoral expression for her own position. She insists on, and is proud of, her own Sami identity. The artist has been instrumental in organizing and leading the Sami art world in the last 30 years. She was one of the initiators in creating the Sami art organizations Sámi Dáiddajoavku/ Sámi Artist Group and Sámi Dáiddačehpiid Searvi / The Sámi Artist`Union in the beginning of the 1970s. These were organizations playing an important political function in a cultural and political resurgence. Art became a tool that played a vital role in the fight for Sami political and cultural organizing. Persen has in the later years focused on her own artistic practice, but her critical voice is regularly heard in relation to Norwegian Sami politics and the Sami Parliaments activities, especially in cases related to Sami art and culture politics. Every visual language is not necessarily a tool for political power, but is naturally and inevitable shaped by culture, ethnicity and tension between classes of society. For that very reason, the art contains and reflects various cultural and ideological values that are in relation to one another, without necessarily excluding other cultural and ideological values. In a search for art that was both innovative and culturally situated, Persen went towards the abstract. An artistic experimentation that recognizes the Sami political past, but abstracted, opens up to a dialogue with Western art institutions modernistic artistic language and places Synnøve Persen’s art in a global setting. Terra incognita is an artistic visualization of the role of the Sami society in the Norwegian democracy. The abstract language opens up for further reflection, discussion and experience, which in turn can show Sami engagement and participation in democratic processes. Davvi álbmogiid guovddáš / Center for Northern Peoples, Dálááiggi musea / Contemporary museum and Riddu Riđđu festivála are cultural institutions working with the challenges and opportunities within cultural diversity and indigenous people’s roles in today’s society. We are pleased to present the exhibition terra incognita by Synnøve Persen in the anniversary year of 2014.